Yesterday was our first day back to work after the holiday break and it was an interesting one. At around 11:15 I got a call from G. He had just gotten a call from day-care and J had apparently fallen in the playroom and hit her head. 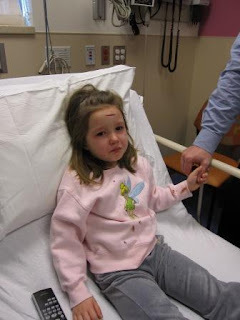 He ended up with a large gash in her forehead, so they took her to the emergency room by ambulance and G was on his way to meet her there. He called me when he got there and said she was ok, but I still left work to meet them so I could see for myself. She was a pathetic little thing when I got there, with a 2, maybe 3, inch cut on her forehead. The dr said it wasn't too deep and they cleaned it out and glued it back together and covered it with sterile tape and sent us on our way. She just needs to keep it clean and dry for the next week and he said she should avoid running/jumping for a little while (this is almost impossible for J, she just doesn't sit still). Overall, she's fine. She got to ride in an ambulance -- which is cool. She said it hurt "a little", but I think she was more freaked out about the blood running down her face than the actual cut. She has to miss gymnastics this week, which is a total bummer. They said to be sure to use lots of sunscreen this summer to minimize the scaring. She's one tough little girl!